Open this beautifully hand-crafted authentic Babushka Santa doll to reveal 5 nesting Santa dolls! Kids (and adults!) will love revealing the different-sized Santas that are tucked away inside each wooden Santa doll. The wooden Santas nest inside each other and are taken apart to reveal smaller Santa dolls fitting inside one another. Each doll is a beautiful piece of art, handcrafted and painted by Russian artists. This means no two dolls are ever 100% identical as the dolls are never mass produced and are lovingly made like works of art. Our authentic Babushka dolls are made from 100% wood, and hand-painted with beautiful detailing. After the paint has dried, the dolls are finished with 3-5 layers of protective coating clear lacquer. All paint is non-toxic. Height of largest Santa is approx 16cm. Please note as each doll is individually hand-painted, styles may vary slightly. Each set includes 5 Babushka dolls (Christmas tree in picture is not included). 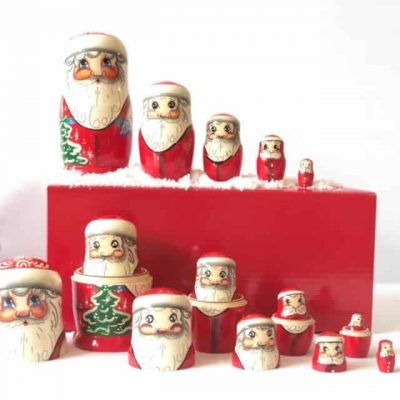 Checkout our full range of Christmas Babushka dolls here. 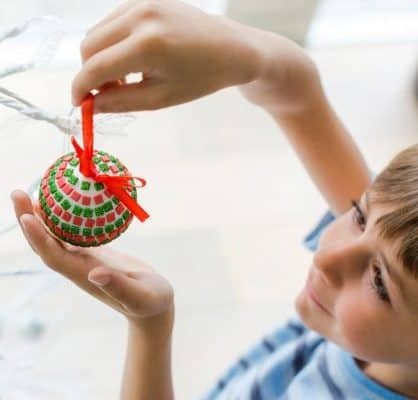 Both kids and adults will love building these beautiful Ravensburger 3D PuzzleBall Christmas Ornaments to hang on your tree or use as a decoration. 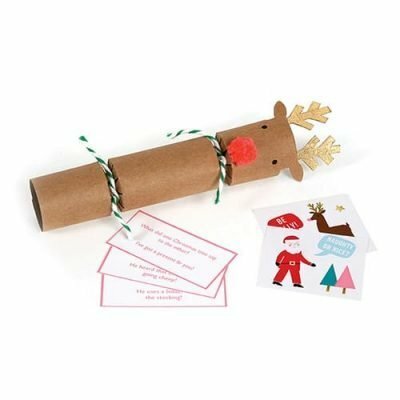 Great stocking stuffer gift for kids! Each Puzzleball includes 54 pieces and comes with a base stand and string for hanging and measures 7cm in diameter. 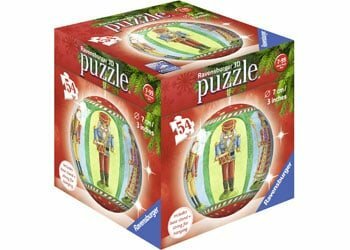 The Ravensburger Christmas PuzzleBalls are crafted with curved puzzle pieces that allow for an exact fit and are easily put together to form a solid, smooth ball – with no glue required! Recommended for ages 7-99. See our full range of Christmas jigsaw puzzles here. 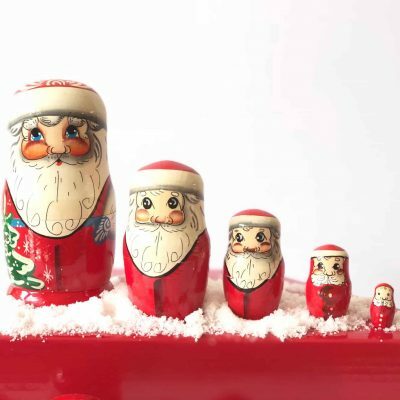 Open this beautifully hand-crafted authentic Babushka Santa doll to reveal 5 nesting Santa dolls! Kids (and adults!) 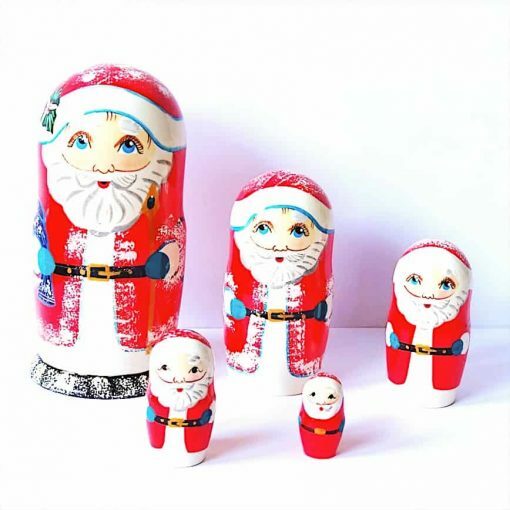 will love revealing the different-sized Santas that are tucked away inside each wooden Santa doll. The wooden Santas nest inside each other and are taken apart to reveal smaller Santa dolls fitting inside one another. Each doll is a beautiful piece of art, handcrafted and painted by Russian artists. This means no two dolls are ever 100% identical as the dolls are never mass produced and are lovingly made like works of art. Our authentic Babushka dolls are made from 100% wood, and hand-painted with beautiful detailing. After the paint has dried, the dolls are finished with 3-5 layers of protective coating clear lacquer. All paint is non-toxic. Height of largest Santa is approx 11cm. Please note as each doll is individually hand-painted, styles may vary slightly. Each set includes 5 Babushka dolls (Christmas tree in picture is not included). Checkout our full range of Christmas Babushka dolls here. 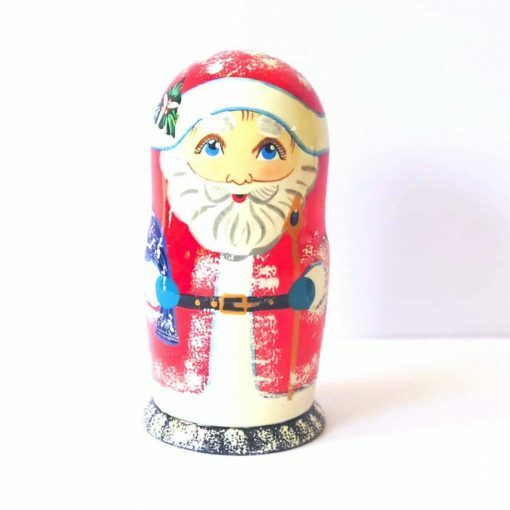 Open up the beautifully hand-painted Santa Babushka Doll to reveal 5 wooden decorations for your Christmas tree! 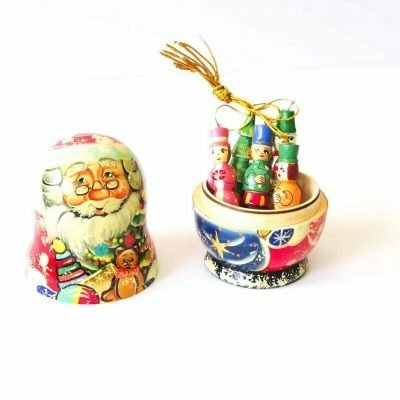 A Korobnik is a beautiful Russian tradition where a Santa Babushka is filled with little Christmas decorations to hang on your Christmas tree. 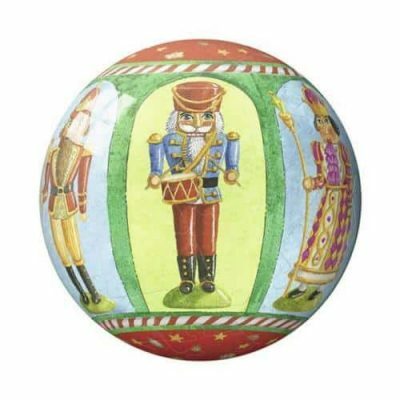 All the pieces of the Christmas Korobnik are lovingly handcrafted and hand-painted by Russian artists. Each doll is a beautiful piece of art, handcrafted and painted by Russian artists. This means no two dolls are ever 100% identical as the dolls are never mass produced and are lovingly made like works of art. Our authentic Babushka dolls are made from 100% wood, and hand-painted with beautiful detailing. After the paint has dried, the dolls are finished with 3-5 layers of protective coating clear lacquer. All paint is non-toxic. Height of largest Santa is approx 12cm. Our authentic Babushka dolls are all handcrafted in Russia. Please note as each doll is individually hand-painted, styles will vary slightly. 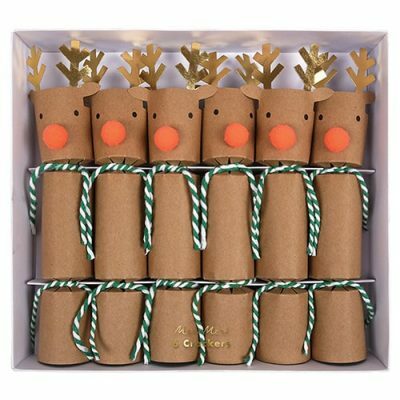 These will make beautiful unique handmade gifts for both children and adults. 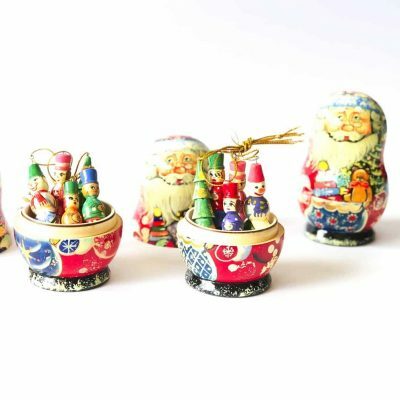 Each set includes Santa Babushka filled with 5 hanging decorations (Christmas tree, Christmas figures, snowman). 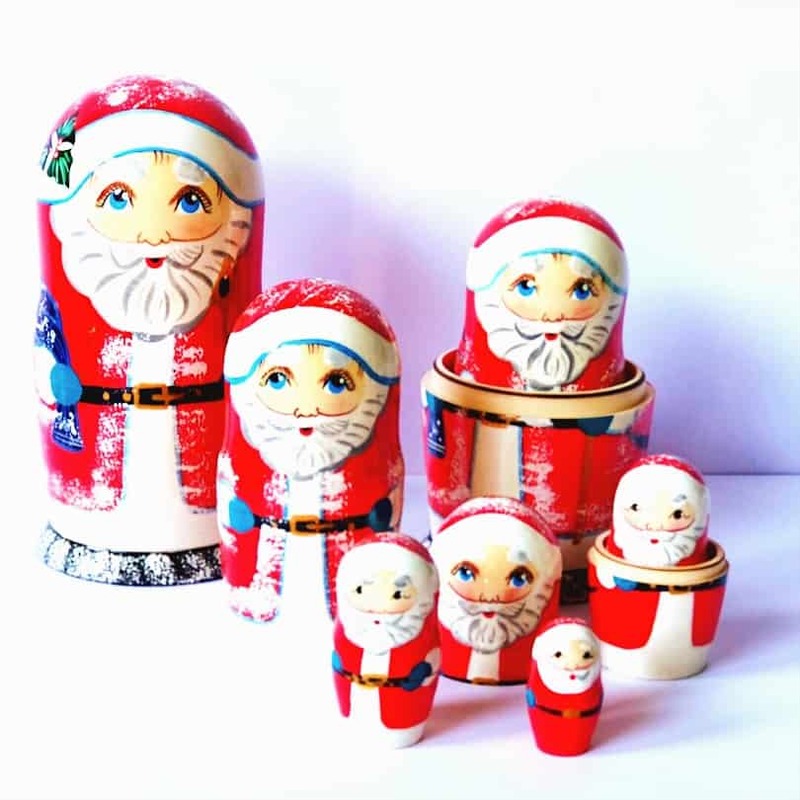 Checkout our full range of Christmas Babushka dolls here.